MSP Mike Rumbles has tabled a parliamentary motion to be placed before the Scottish Parliament on 7th Feb, that we believe will help all Scottish campaigns to stop the impact of overhead transmission lines on the Scottish Landscape. Timing is short for input to the democratic system. If you can, please act this week! This was revealed at last Mondays public meeting in Alford and I apologise if I am repeating matters that you are already informed upon and processing. SSE are currently planning to place 50m high pylons to create a new transmission system from Inverness to Kintore,Aberdeenshire. I’m a member of a group (www.wapa.org.uk) trying to make sure that project has as small an impact on the landscape and environment as possible. Here is the copy of Mike Rumbles email to use explaining his position and actions. I thought that I would let you know what I have been doing since the public meeting on Monday evening. That the Parliament notes the concern that has been expressed by communities in proximity to Scottish and Southern Electricity Network’s proposed Blackhillock to Kintore transmission reinforcement regarding the development’s potential visual impact; understands that the National Assembly for Wales unanimously passed a motion on 18 January 2017 endorsing the use of underground cables and alternatives to pylons where feasible, with a view to minimising the visual impact of such infrastructure; reiterates what it sees as the need for effective community consultation and the importance of incorporating feedback as a means for addressing such concerns; believes that the outstanding natural beauty of this countryside, for example the area around Bennachie, must be protected, and notes the communities’ urgent calls for the existing plans to be the subject of substantial change and mitigation action in order for this to be achieved. I have convinced my party colleagues to agree that my motion should be lodged and debated during a members debating time slot (I only have one opportunity to choose a subject for debate and I have chosen this one) as it happens the next Liberal Democrat slot comes up on Tuesday 7th February (as a party we only have three per year). The only other requirement to secure the debate on Tuesday 7th February is that I must have cross party support from MSPs in other parties. I have a meeting with Alexander Burnett at 4.30pm today (Alexander is the Conservative Party’s Energy spokesperson and of course is the constituency MSP for Aberdeenshire West) Hopefully Alexander will sign my motion in support and then I will aim to get others too! P.S. Securing a members debate in the Scottish Parliament means that although no vote is held at the end of the debate, MSPs have an opportunity to speak and express their views and the responsible Minister has to attend and respond to the points raised in the debate. It is a most effective way of obtaining policy changes from the Scottish Government! If you are interested in this issue please help by asking their MSP’s to support the motion. For your information, WAPA are sending out the attached email to their members. WAPA are asking it’s members to use the www.writetothem.com website to find and write to their MSP’s and MP, urging them to support the motion which hopefully will protect all of Scotland’s landscape. It’s easy to cut and paste a letter into this site. Here’s the letter we’re suggesting be used as a starting point to be modified as each writer desires. For parliamentary reasons it has to refer to SSE’s latest project and the final paragraph speaks specifically to this. was passed with 51 members for and none against. I believe that this resolution is as applicable to the Scottish environment as it is to the Welsh, and I request your support for the motion when it is brought before the Scottish Parliament. Furthermore, and with reference to the plans under development for the Blackhillock to Kintore transmission line, I object to this proposal in its current form and request that you support the motion which sets out to protect the natural beauty of the area that this proposed development will damage. The wider and more numerous the letters received by MSPs, the better chance of success for us to keep Scotland’s landscape intact and we are asking for your help to spread the word. If you have comments or can advise us in any way, please feel free to get in touch. 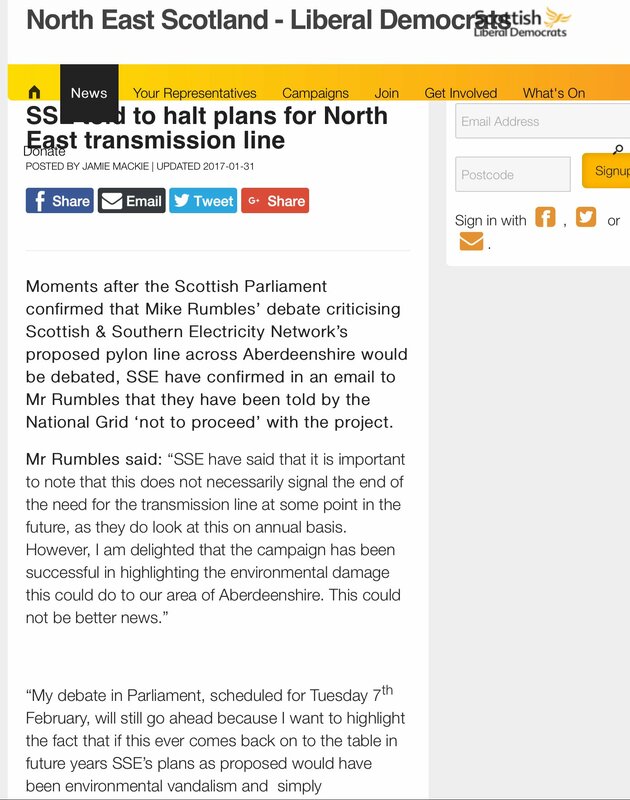 failing that, SSE should upgrade the existing 275kV line from Keith to Kintore. They feebly have said the clearances on the pylon arms won’t let them do that – so they should either design simple upgrade kits (put this out to competitive tender?) or replace the pylons there since the wayleaves are already in place. Please visit our websites and join our Facebook pages – and keep objecting!